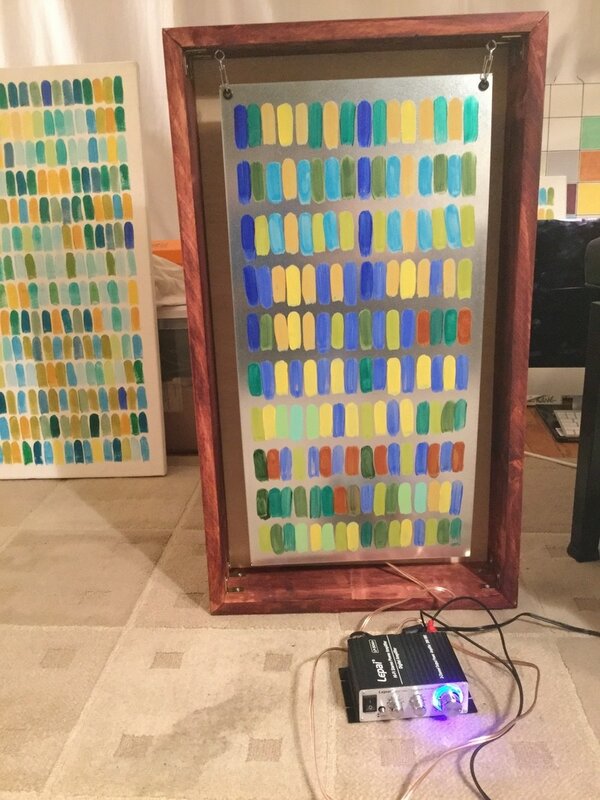 This collaborative sound art installation explores color and vibration translational adaptations of Prelude of Bach's Cello suite #1. 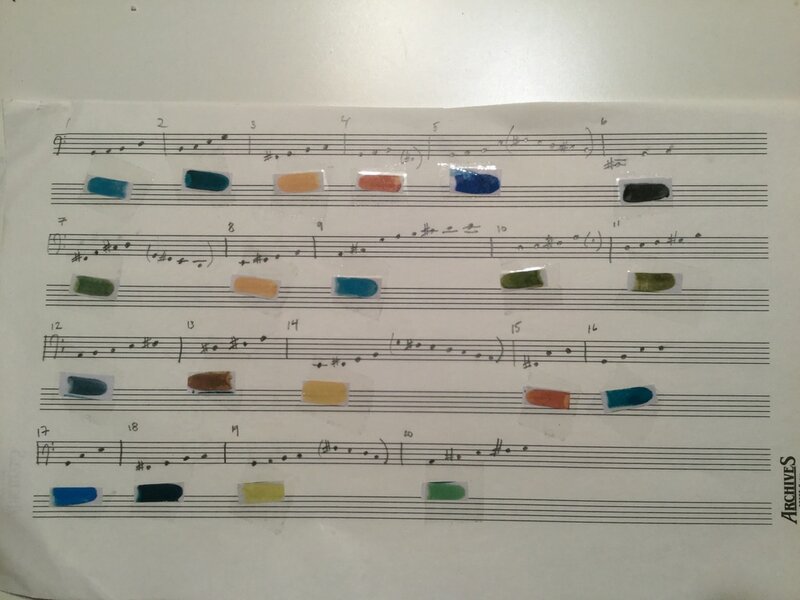 Influenced by Sir Isaac Newton’s 1704 treatise “Opticks: Or, a Treatise of the Reflexions, Refractions, Inflexions and Colours of Light,” in which he proposes a correlation between sound frequencies and light spectrum, Amy has explored systems of color-coding in which each pitch is assigned a particular color, and each note is represented by a single stroke on a large grid-like surface. The resultant works give a pictorial summary of the music, in which the well-known Bach prelude is translated into a kind of cryptic geometry. 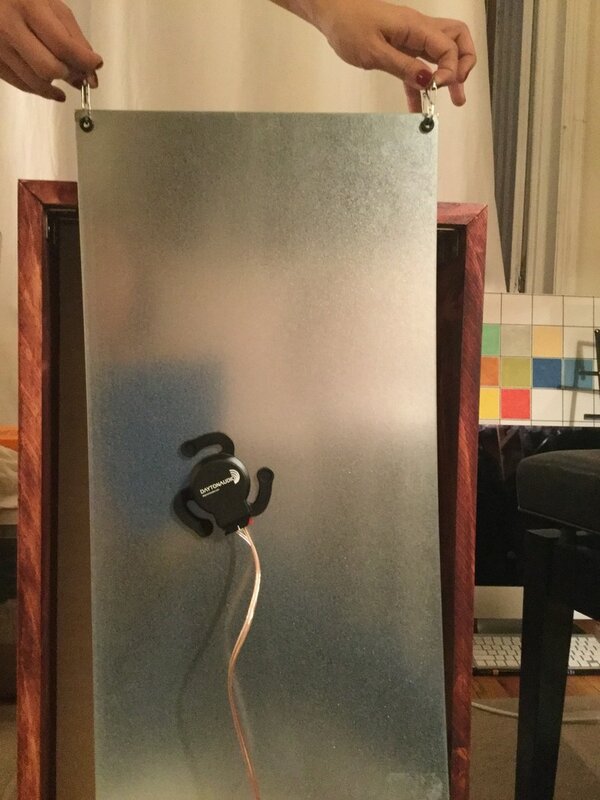 A recording of a cello & piano being played through a transducer attached to the back of a sheet of stainless steel. There are NO live performers and NO traditional speakers! What is the effect of the sheet metal? It gives the recording a shimmery "antique" sound, and blends the sound of the instruments together. What is the music that we hear? 3) an improvisation on the Bach prelude in which we add piano to the mix and each distinct color within Amy’s painting serves as a source of energetic, motivic and registral inspiration.